It's time for Apple product launch No. 2. According to a new report from Recode, Apple plans to hold an event October 16 to introduce its newest iPads and Macs. The site said the launch will be "a more laid-back affair" compared with the iPhone launch in September. Recode correctly reported the date for that earlier event. The launch would come about a month after Apple showed off its newest iPhones and its first wearable, the Apple Watch. The company introduced the products during a splashy, star-studded event at the Flint Performing Arts Center down the road from its headquarters. The venue on the De Anza College campus was the same place former CEO Steve Jobs unveiled the first Macintosh computer in 1984, and guests such as band U2 helped Apple usher in its latest products. This time around, Apple has opted to hold its event at its Town Hall Auditorium at its headquarters, Recode said. It launched the iPad Air, iPad Mini with Retina Display and Mac Pro last year at the Yerba Buena Center for the Arts Theater in San Francisco. The year before, Apple held two iPad events, one in October at the California Theatre in San Jose, Calif., and one in March at the Yerba Buena Center. Apple this year is expected to show off new iPads and its Mac OS X Yosemite software for computers, which the company revealed at its Worldwide Developers Conference in June. Apple also could introduce new Mac computers, including new iMacs. Recent reports say the iPad could include a gold option, as well as the Touch ID fingerprint sensor found on iPhones since last year's 5S. Apple's iPad, first released in 2010, changed the computing market and spawned scores of copycat devices. Even Microsoft, Apple's longtime rival in the PC market, produced a tablet, introducing the Surface in 2012. Since unveiling the iPad, Apple has dominated the tablet market, most recently ranking No. 1 with 27 percent tablet share globally. The iPad is Apple's second-biggest moneymaker after the iPhone, with about 15 percent of total revenue coming from the tablet. But the company now needs to find a way to revitalize iPad sales. Apple's tablet hasn't been selling as well as it used to. 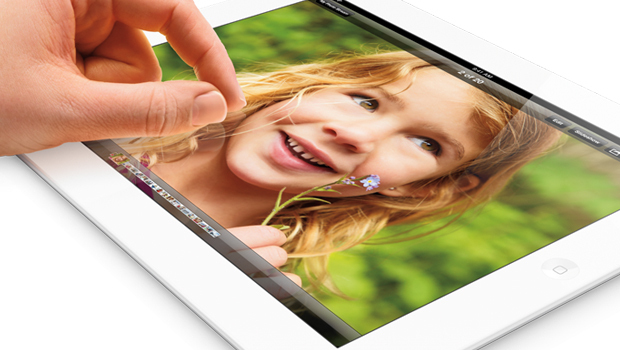 Sales of the iPad have declined year-over-year and fallen short of analyst expectations for two straight quarters. In the period ended June 28, Apple sold 13.3 million iPads, down 9 percent from the previous year and below the 14.4 million expected by analysts. Apple has attributed the weak iPad sales to a couple of factors -- softer demand and an issue with the number of devices held in channel inventory (which means they're either sitting in stores or on trucks). In reality, Apple likely has been hurt by a few factors that could continue to plague iPad sales. It's easy for people to pass older tablets to relatives or friends when they upgrade. People also don't have the two-year upgrade incentive that smartphones get from wireless carriers, and Apple hasn't made big enough changes to the iPad to compel even its most ardent fans to immediately buy the newest model. In addition, most people who crave a tablet likely already have one, and Apple is going up against dozens of new, inexpensive devices that run Google's rival Android mobile operating system. Consumers also now have the option to buy bigger screen iPhones, such as the 5.5-inch iPhone 6 Plus, rather than buying one of Apple's iPads -- which currently come in 9.7-inch models for the iPad Air and 7.9-inch models for the iPad Mini. Apple CEO Tim Cook said in July that he's "bullish" about Apple's prospects in the tablet market. "We still feel the category as a whole is in its early days, and there's still significant innovation that can be brought to the iPad and we can do that," he said. Tune back to CNET for full coverage of Apple's upcoming event. Shara Tibken is a staff writer for CNET focused on consumer tech news. She previously wrote for Dow Jones Newswires and the Wall Street Journal. She's a native Midwesterner who still prefers "pop" over "soda."